Each year, more than 1.5 million people attend the National Cherry Blossom Festival in Washington, D.C. to glimpse a colorful sign of spring. But while this year’s peak bloom was in line with the 96-year average, over the long term spring is actually springing sooner — due to climate change. This change isn’t limited to the cherry blossoms, either; recently published maps from NASA Earth Observatory have revealed how much earlier the season is starting in national parks around America. 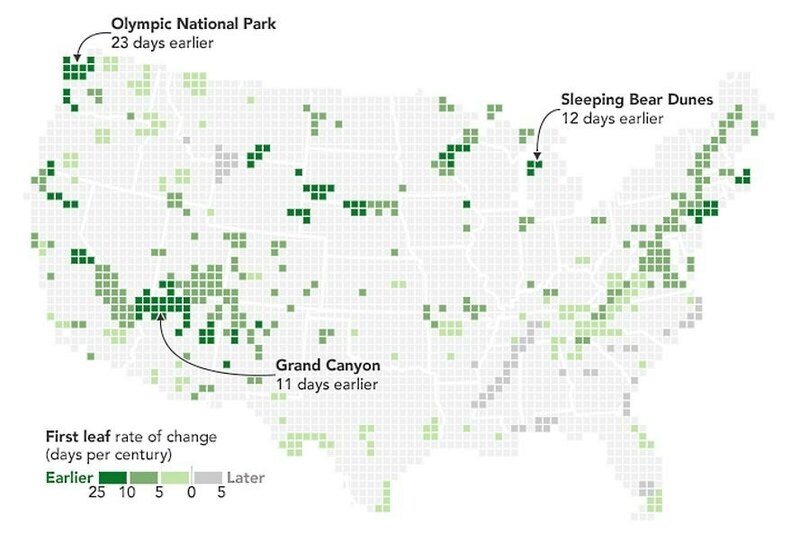 The maps show the “rate of change (days per century since 1901)” for first leaf and first bloom, drawing on data published in 2016 by National Park Service (NPS) ecologists. 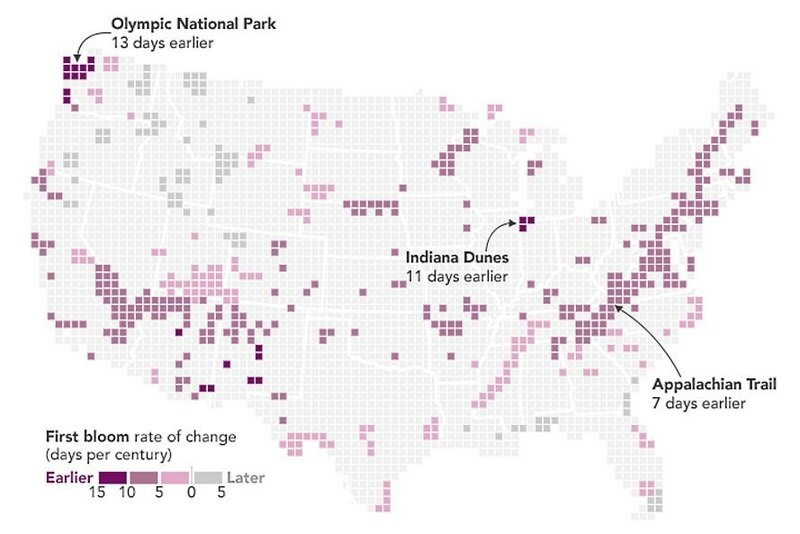 NASA Earth Observatory looked at 276 parks to discover around three-quarters are experiencing earlier springs — and over half are seeing extreme early springs. Parks have had to alter the timing of opening park facilities, hiring seasonal staff, and commencing control of invasive plants and pests. The National Cherry Blossom Festival has also been extended, so that it’s more likely for the peak bloom and the festival to overlap. 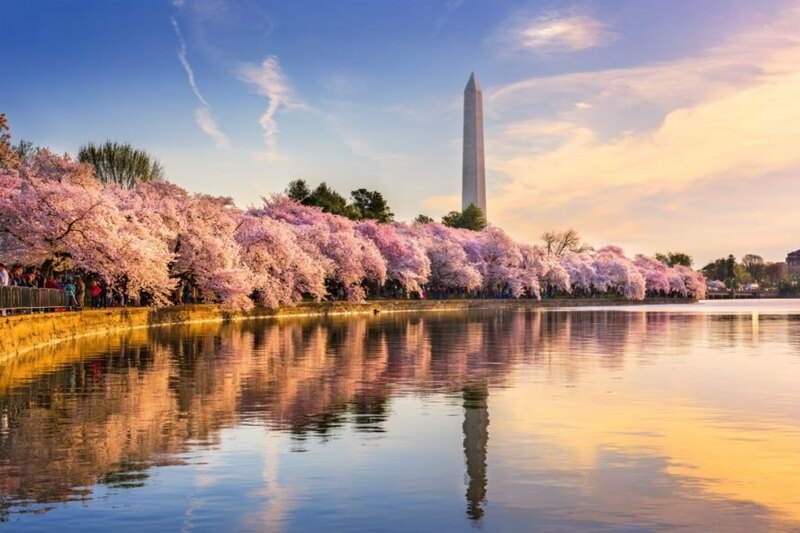 According to the National Cherry Blossom Festival website, the event now takes place over four weekends, as opposed to the two weekends it lasted in 1994 (although the festival website didn’t specifically attribute the length to climate change). The magnitude of change differs across the parks; for example, in Grand Canyon National Park, spring is appearing almost two weeks earlier than in 1901, according to NASA Earth Observatory. Conversely, some parts of the southeastern United States haven’t experienced as much change. Spring is arriving earlier in national parks around the United States. Spring is emerging earlier around America due to climate change. This map from NASA Earth Observatory shows the rate of change in terms of the first leaf. This NASA Earth Observatory map shows the rate of change in terms of first bloom. Peak bloom for the cherry blossoms in Washington, D.C. in 2018 was in early April.